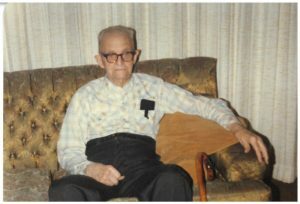 In the old days of rural schoolhouse education in Mesa County and the Western Slope, most kids simply withstood the smacked wrists and hits they received from teachers, and understood it was the price for bad behavior. Farm and ranch kids, the boys especially, were thought to be wild by nature, and they often simply disappeared from schools after a few years of education to work. One boy, as described by his classmate from the early Twentieth century in a Mesa County Oral History Project interview, picked up his teacher, carried her kicking and screaming from a rural schoolhouse, and threw her into a creek after she hit him (unfortunately, I cannot remember in which interview this tale is recounted). This example of student vengeance pales in comparison to the story of Walt Carmichael. His teacher in Plateau Valley often whipped Walt, who was only seven years old, trying to make him cry. Walt would only smile at the teacher, but he remembered all of those beatings. One day when he was older, Walt ran from the schoolhouse with the end of a rope, yelling, “I got him! I got him!” The school children outside the school, including interviewee Reuben Pitts (who describes the incident in the soundbite below), all ran to help, thinking that Carmichael had captured a deer, elk, or maybe even a bear. The children grabbed the rope and pulled and dragged it to a cedar tree, where they intended to hang it from a branch. Then their teacher came tumbling and yelling backwards out of the schoolhouse door. He had been asleep in his chair with his back to the door when Carmichael tied a lasso around his neck. To hear more about rural schoolhouse education and shenanigans, visit our catalog. 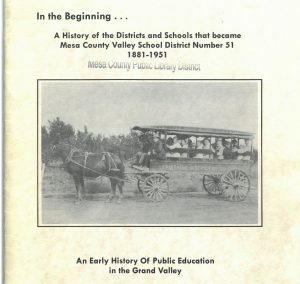 To learn more about the history of Mesa County Valley schools, checkout the very helpful book, “In the Beginning… A History of the Districts and Schools that became Mesa County Valley School District Number 51” by Albert and Terry LaSalle.